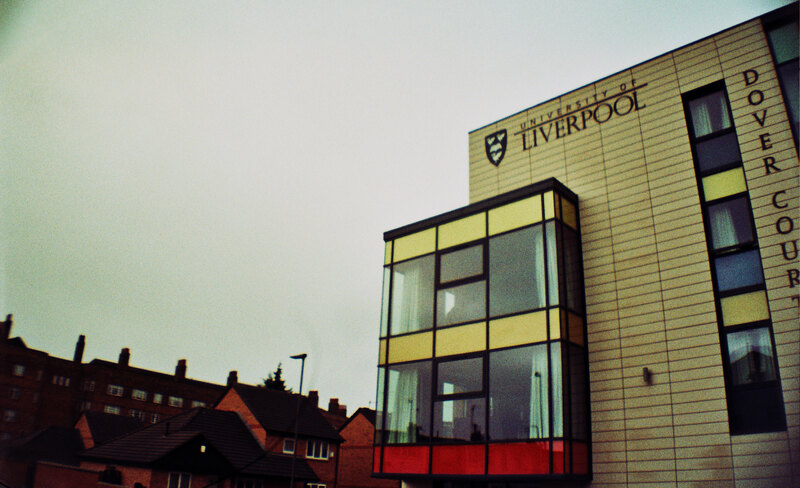 It’s an oft-stated critique of Liverpool city centre in recent years that it’s become an increasingly oversized student campus as opposed to a city. 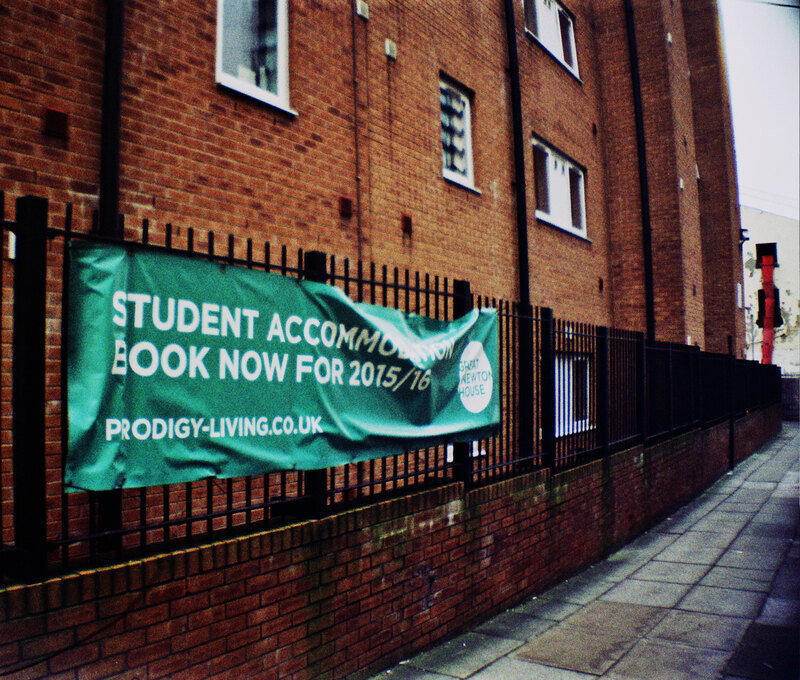 A number of local writers and commentators, including an excellent summation earlier in the year by Seven Streets, have mentioned the suspiciously sheer abundance of developments comprising purely of student accommodation within the centre though it has rarely been quantified as a reality if only because the sheer number has reached such a peak as to be almost axiomatic as a point. Yet I wanted to clarify this assumption and see really whether the city had been largely sold off to private developers in this area, so I planned a walk around the centre in order to assess the damage (of which it now most definitely is). On a rainy day in February, I set out with my camera and a brief outline of several student flat development marker points with the following rule: I was to be allowed no longer than five minutes of walking between a potential student accommodation building, whether it be an ugly, new-build high-rise, the taking over of an older building, or some university built housing site. 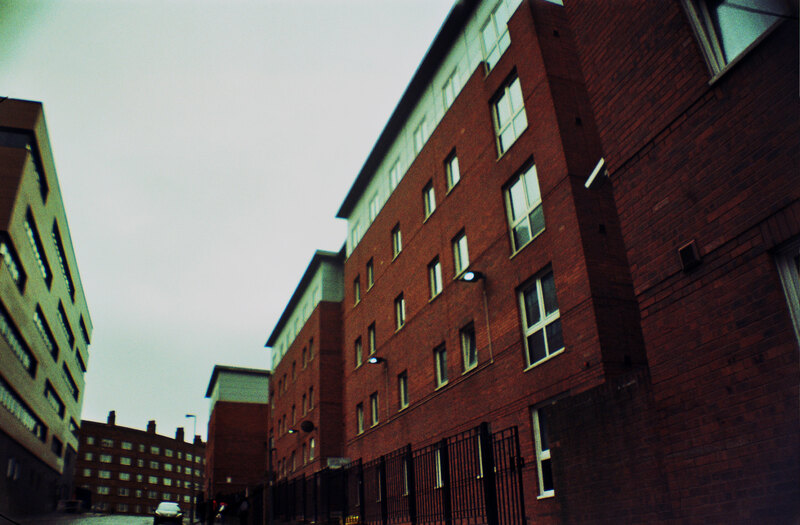 If I was unable to find a building within that restriction then, at least for me, I would lose the bet with myself and not be able to reverse the logic of the premise which is, basically, the reality of “You can’t walk five minutes without seeing a student flat development!”. Because I live within a stone’s throw of the campus of the University Of Liverpool (where I currently do my PhD), it may go without saying that as soon as I left my front door student flats where to be ubiquitous. Walking along Catharine Street lead to the first and one of the less auspicious developments, Agnes Jones. 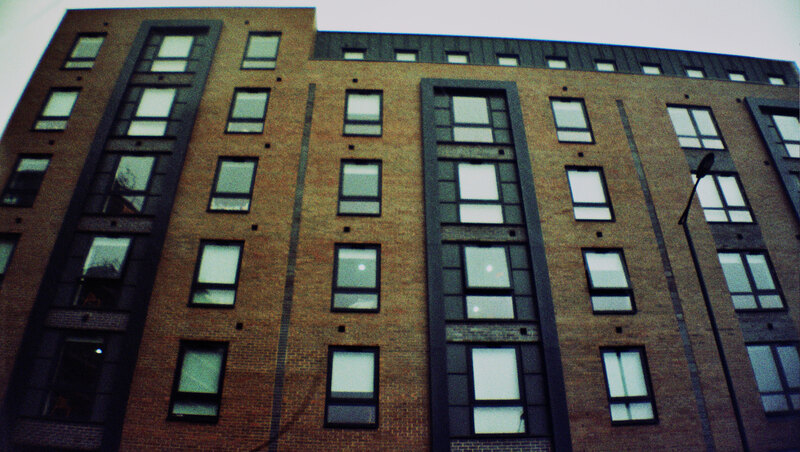 Unlike its modern peers, the architect has at least attempted to hide the pre-fabricated reality of the student flats behind the Georgian exterior; such effort seems beyond the modern batch of designers and developers. 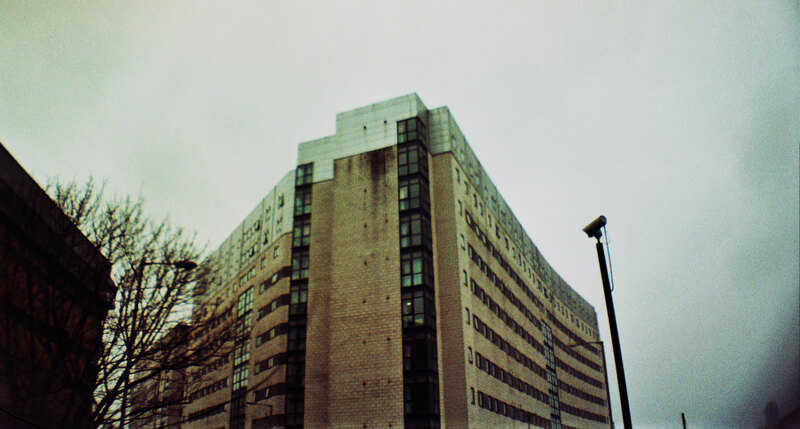 The illusion, created by what was once a women’s hospital, is quickly broken when walking behind it, its true character perceivable behind a high fence which eventually melds with the Georgian properties behind (also all student exclusive). 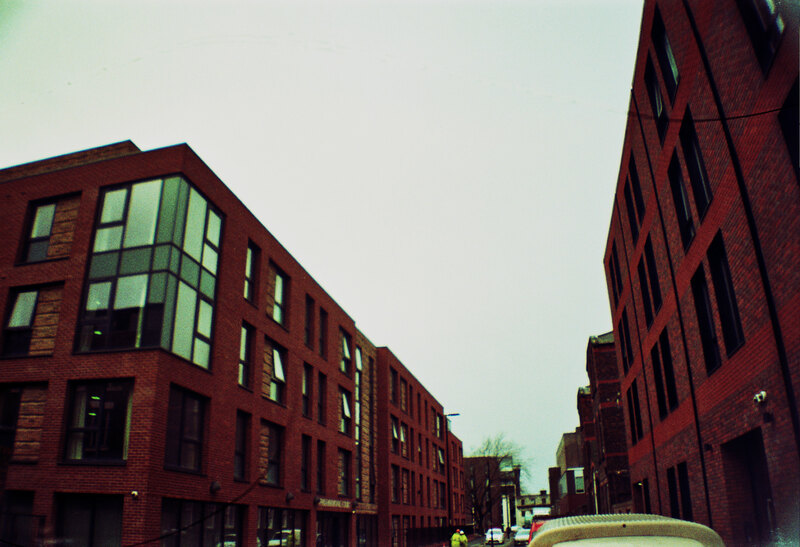 Following this down Back Bedford Street, the first of the horrifically pointless new builds came into view. 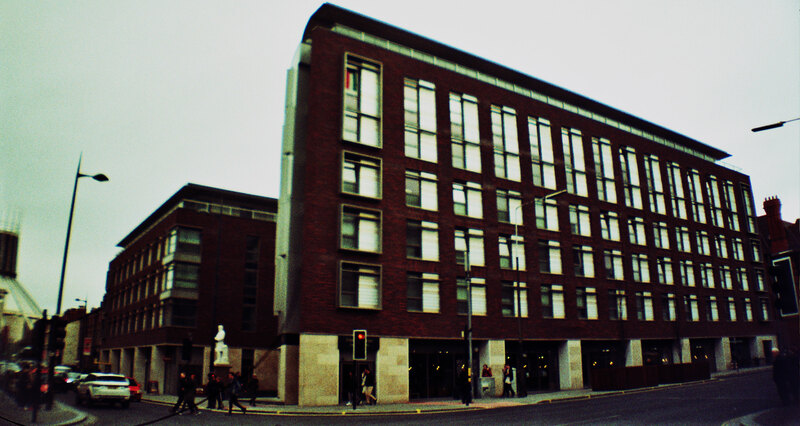 This has been one of the more controversial projects, effectively evicting a number of independent restaurants from the strand leaving only a Tesco (which also has student accommodation already built into it). I remember last summer visiting the Greek restaurant, Eureka, which sat on the edge of the Myrtle Parade before it got flattened to make way for these flats. I took the picture below to show what the development had effectively done; shutting out the light to the point where the photo almost came back blank. I spoke with the owner, as I was its only customer at the time, who was dismayed at having to move further out of the city because the rents locally had been so pushed up as well as the fact that he had effectively been forcibly moved. I’d be interested to hear from the residents of the adjacent housing site who, if not having light blocked out for a good chunk of the morning, will at the very least be incredibly overlooked once the block is finished. This development wouldn’t feel so frustrating if, just over the way, the University hadn’t already built a huge multiplex of accommodation and Costa Coffee in the form of Vine Court only quite recently. 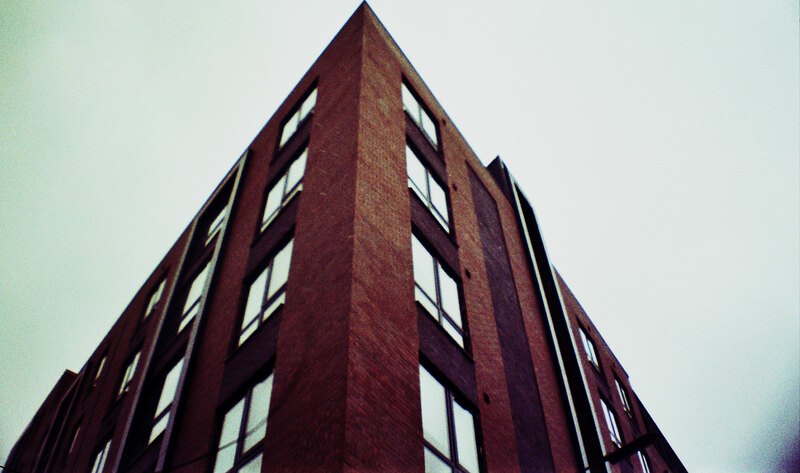 From the buildings already seen, an aesthetic likeness should be building; a strange, cheap biscuit of a texture with thin, slit windows and commercial spaces used by very typical companies in their lair. I walked on. Back onto Catharine Street a virtually identical development was built around three years ago on the very corner. The same aesthetic of biscuit nonsense prevails, built up like Lego and with clearly high-level rents for the commercial spaces underneath as only Greggs, Nero and Co-Op seem to be able to afford them. 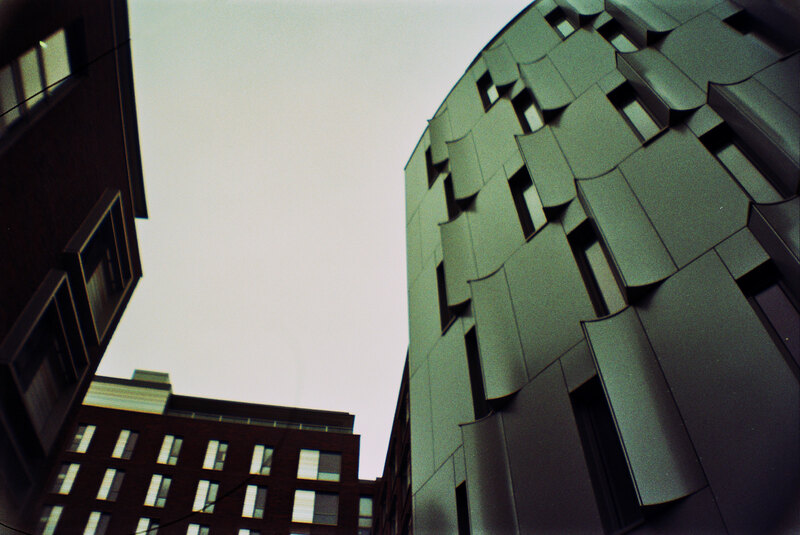 Behind this in Caledonia Street, the recent refurbishments have finished on the old student housing which have magically morphed into a futuristic set of jagged lines and windows that seem to be designed to look like piss-poor versions of work by Piet Mondrian. Perhaps what makes this street now seem so astonishing is that the two different developments effectively creates the illusion of an entirely student avenue; the campus venturing out and taking over more and more space. With this in mind (and with the recent events surrounding various beloved buildings and venues in the city), it’s surprising that the wonderful Caledonia pub is still surviving and hasn’t been forced out. There’s no doubt that it seems almost anachronistic to the characterless and largely empty buildings that now engulf its surrounding space. I had heard about a redevelopment taking place on Hope Street so took a detour down Faulkner Street to see the Hahnemann Homeopathic Hospital built in around 1860. 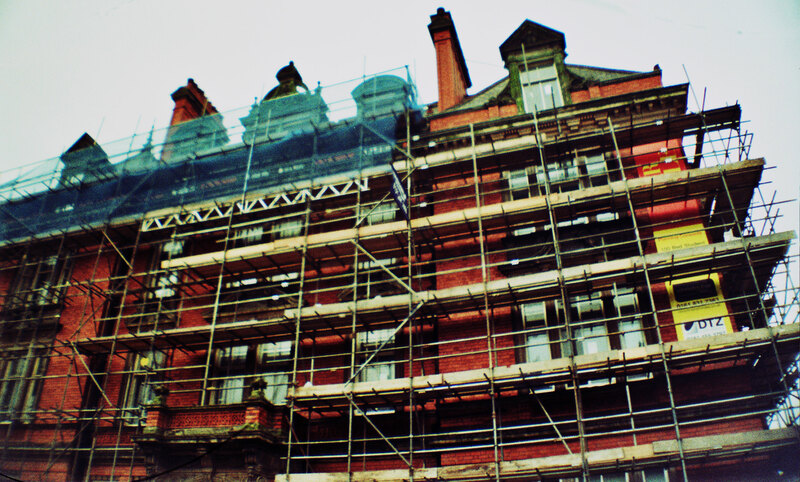 It had an exoskeleton of scaffold and the development has been taken over by the questionable Maghull Group who have controversially planned for it to be the heady mixture of a boutique hotel and 100 student flats. Though this move has formed a protest group against the planned development, it seems to still be going ahead. 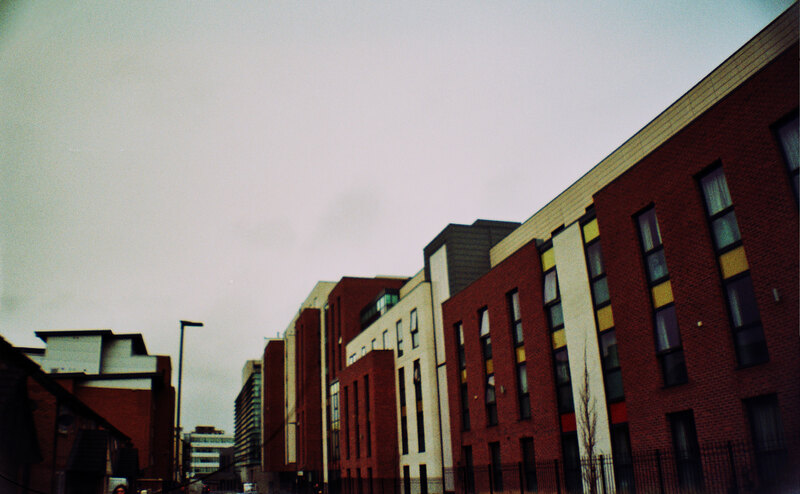 This is especially strange as it not only backs on to the nicest residential street in the city centre (Hope Place) but dominates Hope Street itself – voted the best street in the whole of the UK and Ireland in 2013. The thought of this now gaining that fresher’s week playground atmosphere that dominates the city centre in semester time is depressing to consider. This is only the beginning of the developments around Hope Street though as walking to the Philharmonic end shows. 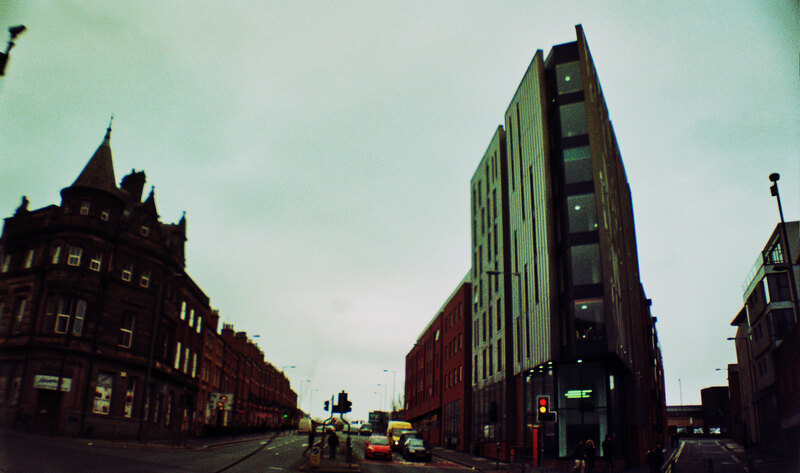 On the corner of Hope Street and Myrtle Street is possibly the worst of these new developments; a huge metallic complex that not only seems empty but has so far managed to sprout both a Costa and a Starbucks under its protective wings. The latter even has its logo emblazoned onto the very brickwork though it is, however, worth pointing out that these are the only real bricks in the building as I spent a mournful amount of time last year watching the builders glue the fake ones onto the main bulk of the building. They have now started falling off to reveal the shoddiness underneath. Though the Hope Street developments are in themselves intensely depressing on a huge number of aesthetic and sociological levels, it’s really the fact that they’re so pointless as spaces that is the key point; they sit in an area where there is already a wealth of student housing which begs the question of why they are being built and, more unnervingly, who is actually making money from giving these developers the go-ahead? 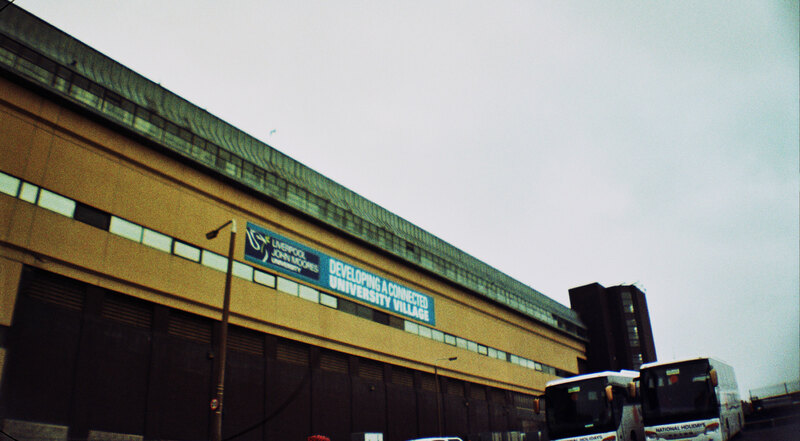 I remember seeing the sign for the Myrtle Street development when it was only just beginning, the advertisement reading “For post-graduate and discerning undergraduates”. What constitutes as “discerning” is debatable though it most probably means affluent. But this is again not strictly the point; the number of students is falling and has been for the last decade. If this was a development largely built for post-graduates (who don’t actually even need to live and, quite often, don’t live in the city where they’re researching) then the sheer scale and design of this building makes no logistical sense. 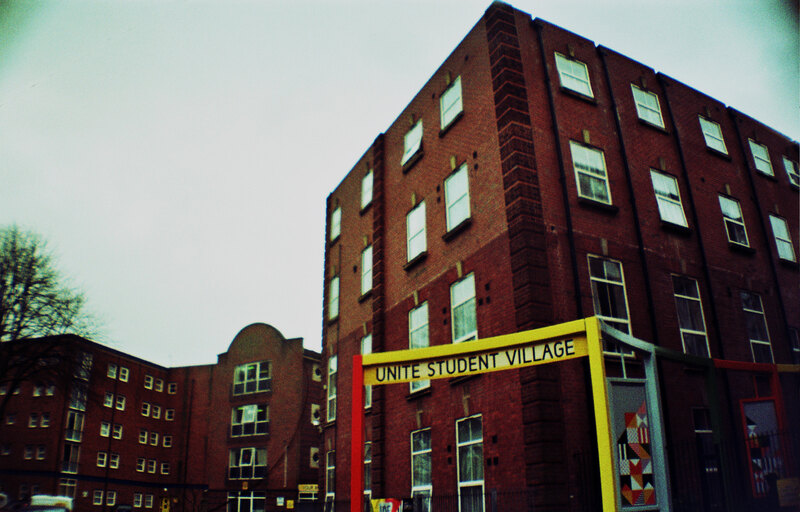 This is especially so as directly behind it lies the John Lennon “Student Village”, again another self-contained student area on the UOL campus. I followed my nose to the end of the campus coming across another faux-Mondrian building development on Great Newton Street with another being built on its other side, cramming the housing estate into a pittance of light and land. There were numerous developments around here again (see photos for details) but the ones I found most intriguing were those taken over by the X1 developers. They are most infamous for building the horrendously designed block on the spit of land between London Road and Seymour Street but it’s their subtler projects that I find more interesting. 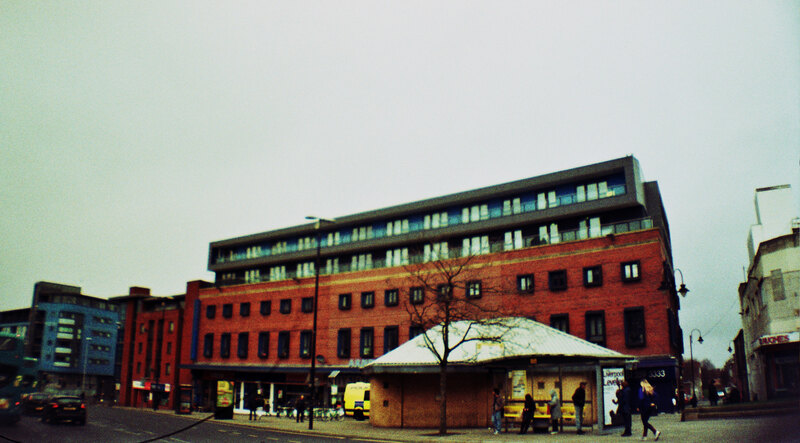 X1 actually own the majority of the space above and behind the shops and a quick look up gives views of various signage advertising their flats. The game is given away somewhat when you can see what’s under these flats in terms of shops; the modest market-place ends and so begins the usual Costa, W.H. Smiths and the like; it’s almost as if these developers and property holders were allowing these tax-avoiding, zero hours employing businesses in with ease quite deliberately. 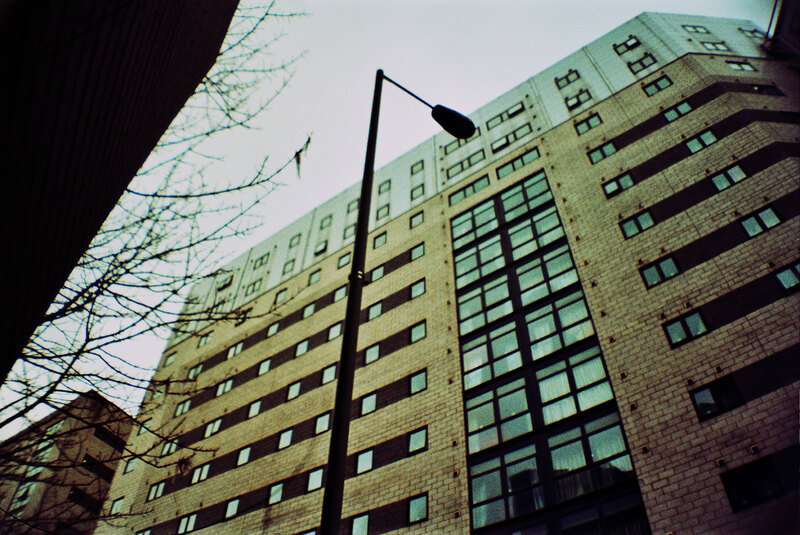 Behind X1’s ugly cheesecake of cheap brick and desperate gym lies a more typical (but equally infamous) student high-rise, Grand Central by Lime Street station. I personally have a soft-spot for this building, at least in the context of the flats in this article, because it is at least honest about the reality of undergraduate living. 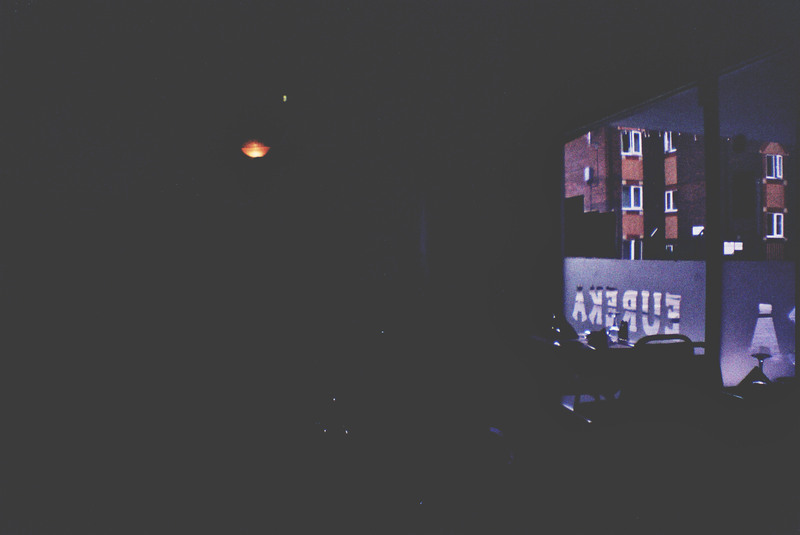 There’s no edgy slogans, pretence at fancy bars or desire to hide the messy reality that student living provides as a fallout to the areas around it. It is earnest in its grit, the stabbed Dorian Gray picture of what having a transient, “once-in-a-lifetime” chasing group of short-term tenants actually produces. This is the reality behind the facade of the middle-class illusions of all of the flats on this walk, even if they do their best to hide such lifestyles from the public who will eventually have to deal with its noisy, messy reality in the coming years if the situation of a ghost town doesn’t prevail. It reminds of a time when sat in The Garden at FACT and overhearing hearing a group of developers – smart suits, macbooks, high-vis jackets – who were desperate to emphasis the “edginess” of their development. The word “edgy” was repeated again and again until they thankfully left to survey the edgy edge-land they were set on undoubtedly ruining. Grand Central, however, has not stopped the frankly balmy project instigated by Liverpool John Moores University of converting the old Post Office sorting station into another “student village”; someone may want to inform the university that, in case they were unaware, the whole city centre is now a student village. I rather liked this space, especially after Biennial had used it for several varying displays in 2014. There was a patch of wildflower meadow just by the path which, on one sunny occasion, I saw no less than five different species of butterfly. The flower-bed has since been gravelled over to make a dozen more car-park spaces. There’s a fitting piece of graffiti on one of the back walls at the end of the building simply reading “Dust, Piss and Dust”; it is an apt foretelling of what will be left of this space once finished with. 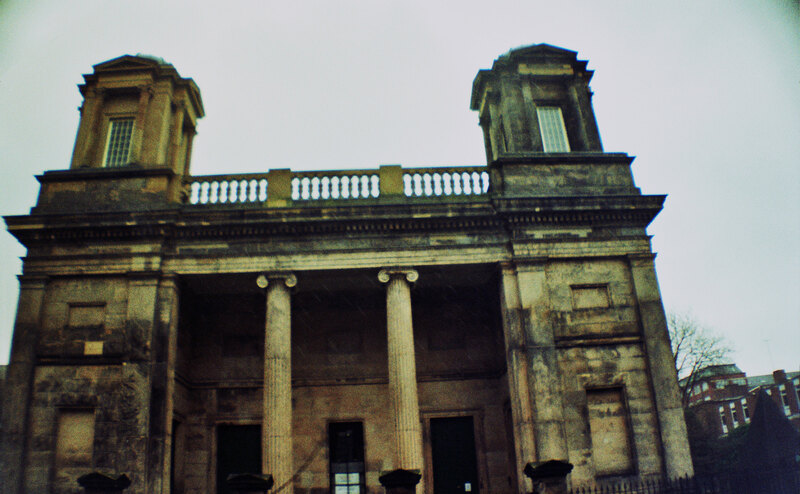 The rain was pouring heavily now and so I made my way back along, eventually hitting Rodney Street and the student conversion of St. Andrew’s Church. There are no words to describe the sheer absurdity that student accommodation has reached when, with breeze blocks in hand, a heritage recognised building (built in 1823) becomes yet another empty space for imaginary students to not live in. Was there nothing else it could have been? A music venue, a gallery, a creative space, a historical centre? 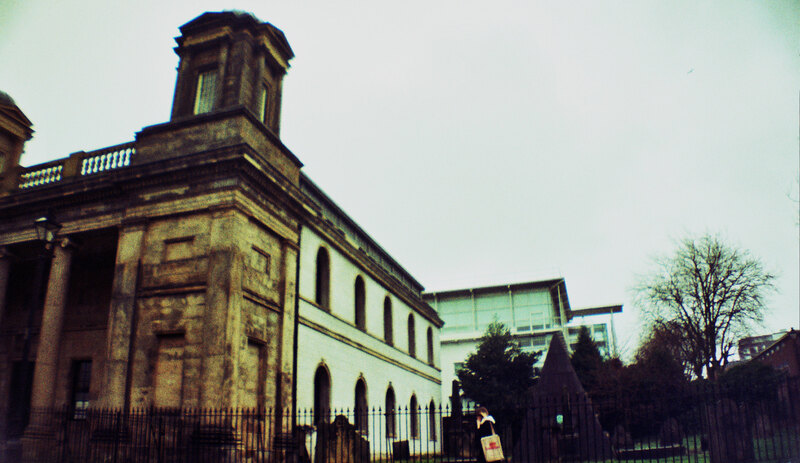 Was there nothing at all that the planning officiators could think to do except vandalise the outside, ignore its adjacent, deeply historic graveyard and just create more shoebox space? Even the Georgian house next to it is a student share. I turned onto Hardman Street and noticed another brand new development currently beginning where the old Brutalist car park had stood opposite the bombed-out church and behind Roscoe Street. Unite are the builders this time though it’s surprising they haven’t attempted to buy the St. Luke’s opposite; such is the potential now for virtually any site that is cared for in the city to fall into private, pointless ownership. Walking past the church and along Berry Street, yet another huge development was finished. What was the Scandinavian Hotel was now “The Arch”. More fond, Biennial memories flooded back of having to invigilate a number of video pieces here in 2010 and naughtily taking the opportunity to walk around the building which resembled a derelict Overlook Hotel at the time. The conversion again drew protests but to little avail. More worryingly is again the yet-to-be -allocated commercial spaces in its basement. It’ll take little guesswork to accurately surmise who will eventually be in there. The walk was becoming unbearable at this point but I knew of one more marker that I thought I could reach so traversed through Chinatown towards Jamaica Street. 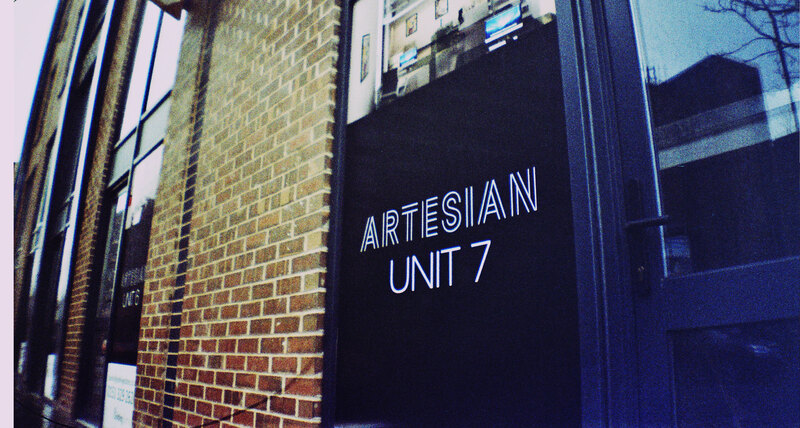 The development in question was the “Artesian” unit opposite (or on top of…) the venue, 24 Kitchen Street. It is another slit-windowed, biscuit building with the heirs and graces of doing some genuine favour to the local people when in actuality doing nothing except take up more space and potential. 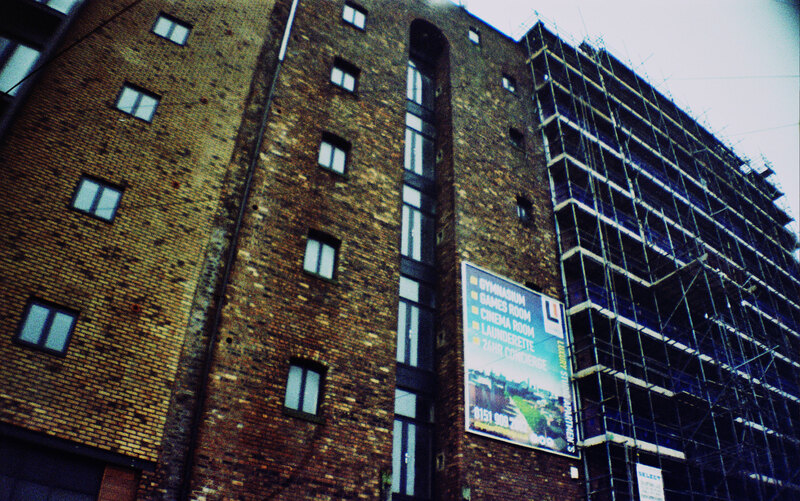 Though not a student development in earnest, its major advertisements on its site suggest otherwise; “This property is close to the Universities, Liverpool One, shopping facilities and popular student restaurants and bars.”. In other words, another student build under the guise of affordable housing (the other clue being that they’re not especially affordable either). 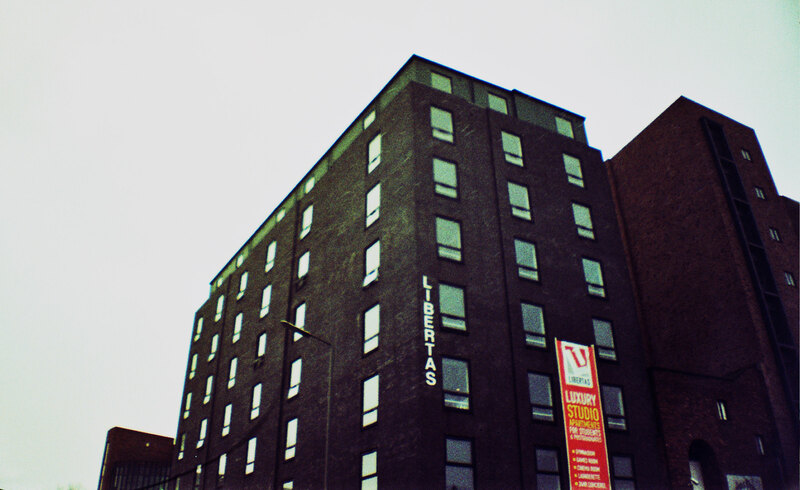 Before hitting this though, I was shocked to see that the whole of the warehouse in front was also now taken over by Libertas as a huge student development; it even has enough space to have its own student housing office and estate-agents style space on the corner. I’d be interested to know how the noise levels from Kitchen Street will especially work alongside the Artesian development though recent history gives me cause for concern, as did the rest of the walk. Baltic is now effectively bookended by student developments though I gave up wandering to the other X1 site situated just by Cains Brewery. From this meander it was clear to me that, far from being an exaggeration, the sheer level of student flat developments is, if anything, an underestimation (and this is, with research, considering the missing out of a huge number of other developments that weren’t found on the walk). It absolutely reeks of under-table handshakes, especially as Mr Joe Anderson decided to align himself with a number of developers recently on a “mission” to Cannes to argue against the heritage status of the waterfront and other things which makes it more difficult for developers to waste even more of the city’s space. The chief problem, aside the sheer aesthetic of such a topographical shift, is that the whole city is being augmented to the needs of an industry which is currently precariously placed. Higher education has never been in greater financial peril with the cuts to funding being channelled onto the students themselves. Add to this the fact that the students are taking out government loans on these huge rates and effectively finishing their degree to come into a situation with few and low paid jobs means that the bubble of sustaining many universities is extremely delicate. If this were to burst (the usual outfall being the closure of departments, usually arts and humanities first), student numbers would decrease even further leaving a huge number of effectively empty buildings right in the city centre; a city that is ironically plagued by social housing needs, homelessness and a need of more creative spaces too. For a sort of dummy-run, walking around this route in high summer, out of semester, should give some taste of what’s to come. But even more importantly is what to do with these buildings if such a financial calamity were to happen. To get a sense of the shift, see below the graph pulled from the Liverpool Development update from March last year. This is the same report where Anderson effuses about almost hitting his general residential quota of building though the graph shows the actual reality in regards to the city centre developments and the startling growth in student accommodation (and “micro-apartments” as the document sometimes calls them); even the jobs they have created are effectively transient. The blue and yellow are student blocks and their spiking is dramatic from 2012 onwards with last year seeing a staggering rise. Also of note is how feebly small the general residential builds are by comparison in the centre (which are often luxury anyway: the document also boasts of the conversion of what was once student apartments in the Georgian houses on Falkner Street, now available for as little as just under £500,000 each…). 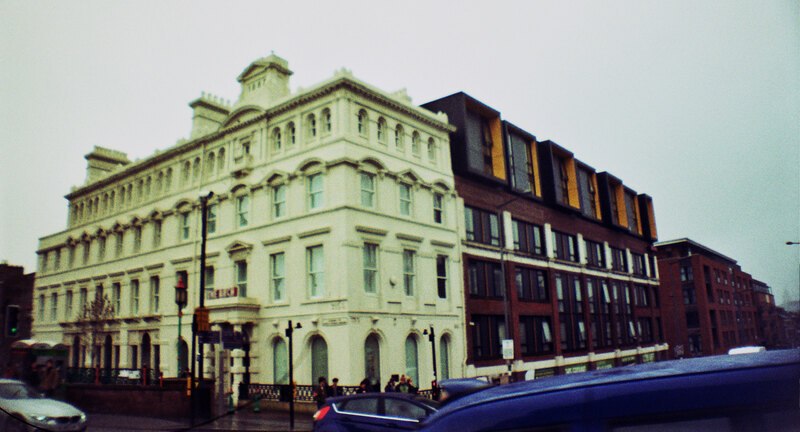 One music promoter joked half ironically on social media that (in regards to the closure of The Kazimier) we would one day have to convert all of these student flats back into music venues. It’s a moot point and he was right but there is a problem; these buildings are shoddily built and designed. They are not the solid, vast spaces left by the husks of industrialisation that can be turned into venues with such ease as has been the case in the city variously over the last few decades. These buildings all have an almost nuclear half-life effect creatively; not only raising the rent prices in the areas where they are situated but rendering the space totally useless and too expensive to convert into anything useful. This is a situation yet to come but the next time a huge development in the city centre draws the eye, ask yourself: who is this for, who is benefiting from it in the long run and what is to come? 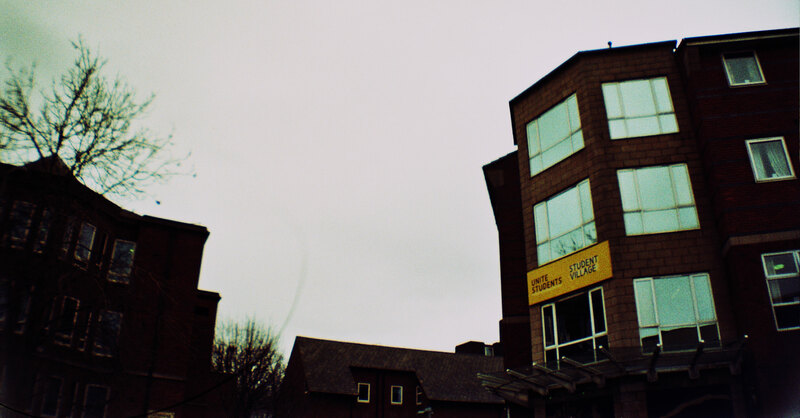 If the city isn’t careful it will become a characterless campus town, a student flatopia and a bland enclave of absolute cultural indifference where the potential for people to make and do great things in the centre was, with hindsight, gradually sold off to the highest, most unimaginative bidder. Responses: Henry Moore’s Sheep Sketchbook (1980).